Welcome to Carey on my Billiard Southern Sun! This home away from home offers a centrally located suite close to UpTown shopping center, library and restaurants. The suite includes brand new appliances, comfortable beds and has a cozy atmosphere. 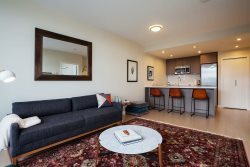 This split level suite is perfect for families, work stays or a vacation to Victoria. One of Victoria's homes from the early 1900s, Carey On My Billiard Southern Sun offers a beautiful red felt Dufferin billiard table in the front room for a healthy evening competition against family or friends.